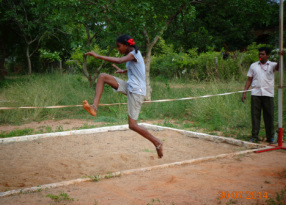 At Udavi school, children play football, cricket, volleyball, basketball, badminton and sometimes table tennis. Here is a report from our football coach. This year the football activity centered around “fun and girls’ confidence” for the younger group, and “technique” for the elder one. The young players, girls and boys mixed, were of 9-10 years of age. While the seniors bunch was attended by 11-14 years old ones. Julian (English native) has helped in coaching the seniors for about 3 full months. The results have been more than satisfactory and the boys have expressed their enthusiasm when working with the 2 of us together towards improvement and better football proficiency. This year I was positively impressed by girls, who finally showed interest and talent when taught through the right drills. 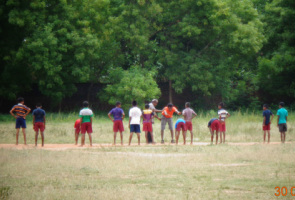 Through confidence building drills/games, children managed to learn having fun. Their skills improved steeply and some of them showed great signs of maturity and leadership after having gone through the coaching. 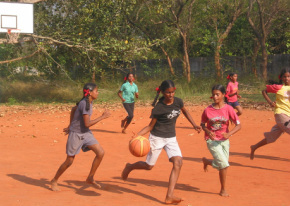 I managed to enroll part of these children in Auroville Football club, after talking to their parents, so that they could get extra exposure and time to practice the sport. Girls attended as well (even though a couple of them could not attend as the families suggested them not to go). As of today I am not aware whether parents are following up and taking interest in their children new sport. who taught all of us new drills and football habits that enriched us all of new knowledge to use on a regular basis. Our program took place during the “evening hours” as to limit the amount of sun we’d get when working on our group skills. Attendance dwindled gradually to few of them, as this extra time activity drew them far from home till too late for some of them. We worked on stretching and attention. Stressed always importance of teamwork and “field awareness”. We devised drills to improve their passing, reactivity to situations, sense of position and technique. We hardly performed purely physical work as we thought the climatic and stress conditions prevented us from further tiring the students, who after all were there only for the fun of it. We trained a couple of them on goalkeeping. We gave everybody a common football technique, passing, shooting habit, but occasionally separated groups to work on specific aspect of the game. In defense we developed: defensive strategy, marking, box clearance, positioning and partnership with goalkeeper. In midfield and attack stressed: attempt to goal scoring despite of position and situation, dribbling one on one, passing and team work strategy, crossing from the flanks, beating the defense. The sessions always finished with a short match, allowing them to play and try new things. Sometimes we restricted their play to classic “3 touch” rule, in order to give everybody a chance to play and learn the rule of passing and receiving back (team work), rather than coaching single dribbling skills. 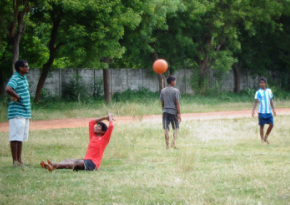 We managed to play few matches mostly against Auroville Football club.